Judy’s Book is the first local rating and review site to add Pinterest sharing to it’s photos. Judy’s Book adds Pinterest sharing to local business images, becoming the first rating and review site to allow users to quickly pin images of their favorite local places. Pinterest a fairly new social network that leverages images and pin boards is growing at a phenomenal rate, in the last 6 months of 2011 the site experienced exponential traffic growth and shows no sign of slowing in 2012. The Pin it button on a Judy’s Book listing is unique since in addition to allowing users to pin businesses and organize them into Pinterest, it attaches unique message to encourage viewers to engage with and links back to the businesses profile page with just a click of the button. Seattle, WA – Judy’s Book, the premier Social Search® site that helps consumers get the trusted scoop on local businesses, announced today that users are now able to pin images of their favorite places on Judy’s Book with the click of a button to their Pinterest account. Images uploaded can be categorized by type of places (favorite restaurants, kid friendly places, attractions, etc..) to pin boards, text to encourage engagement is automatically added in the description of the image, and include a unique back link to the businesses page on Judy’s Book. Pinterest provides virtual pinboards which users can ‘pin’ collections of images to connect people through shared tastes and interests. Pinterest makes it really easy to create pinboards for any category and upload images to it. These can be pictures they have taken themselves or images collected from around the web. Followers get to see images a person has posted and re-pin, allowing other members to see it and cause it to go viral. At this time, Judy’s Book is the only major rating and review site to leverage Pinterest. Not only do users benefit through organizing and sharing their favorite places, but local businesses can leverage another outlet to increasing their social media presence and improve SEO. 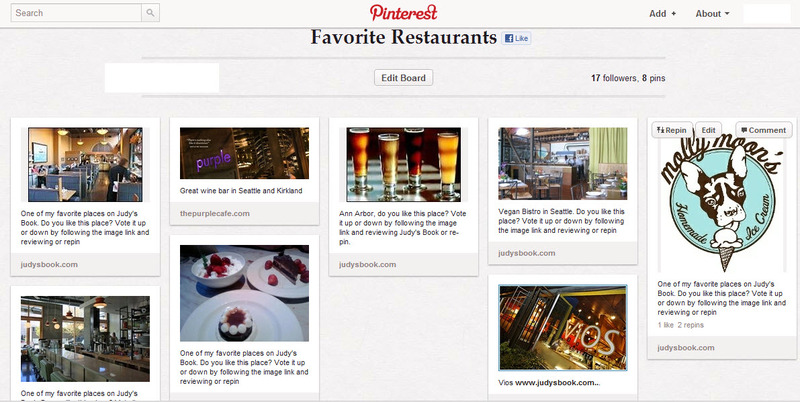 Judy’s Book will only display the Pinterest button for businesses and places that have images loaded. For a business to truly benefit from this we encourage and recommend owners to add compelling and rich photography to their profile that would encourage re-pins. This entry was posted in Judysbook on March 14, 2012 by judysbookblog.